Kit contains, 2 shaft bearings part number 2N4221, 2 housing gaskets part number 2N4035, 2 shaft collars part number 9N4132, 2 bearing cups part number 9N4222, 2 outer axle seals part number D6NN4251A (for 2N and 9N), 2 outer axle seal assemblies part number A8NN4248A (for early 8N), 2 rear axle nut lock rings part number 8N4187. For tractor models 9N, 2N and 8N up to serial number 486753. 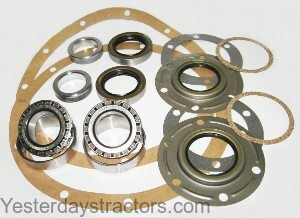 Kit comes with 2 sets of axle seals, one for use on 9N and 2N tractors and one set for 8N. You will have one set not used. New, aftermarket Axle Kit for sale with a solid manufacturer warranty. In addition, we have a generous 30-day return policy if this Ford Axle Kit for Ford 8N, 9N, 2N tractors needs to be returned for any reason. Please see our Parts Warranty and Return Policy links on your left for complete details before returning. Delivery is via UPS Ground or USPS Priority and usually takes 3-5 business days. The shipping charge will be displayed in your online shopping cart. To purchase this axle kit, click the "Add to Cart" button or call toll-free 800-853-2651.